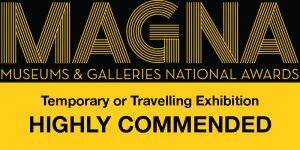 A guided tour of the exhibitions works and history. Starting from the 5th of December and available Wednesdays, Thursdays & Sundays by appointment only. According to Japanese legend the person who folds a thousand origami paper cranes is granted a wish. The iconic crane has become a symbol for the destruction of Hiroshima and Nagasaki by atomic bombs in August 1945, and subsequently a symbol for peace. Throughout the exhibition tour visitors were invited to fold paper cranes and place them in the exhibition spaces. 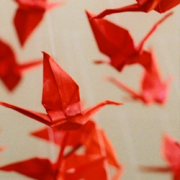 Well over 2500 cranes were produced which were to the Hiroshima Peace Museum. Magnetic Poetry Board – express your self in rhyme, verse & haiku, add your poem to the story of the exhibition. In 1964, with the Cuban Missile Crisis fresh in viewers’ minds, the Cold War at its frostiest, and the hydrogen bomb relatively new and frightening, Stanley Kubrick dared to make a film about what could happen if the wrong person pushed the wrong button — and played the situation for laughs. 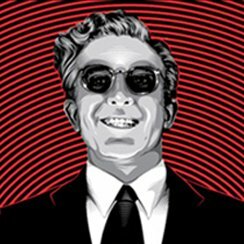 Dr. Strangelove’s jet-black satire (from a script by director Stanley Kubrick, Peter George, and Terry Southern) and a host of superb comic performances (including three from Peter Sellers) have kept the film fresh and entertaining. Stanley Kubric’s iconic Dr. Strangelove or: How I Learned to Stop Worrying and Love the Bomb (1964) was presented with discussion about the film and its history led by Mick Broderick from Murdoch University, Associate Professor of Media Analysis, Murdoch University, Perth. This documentary is a vivid portrait of the era and the songs that embodied it. As the Oils embarked on a tour around the nation performing raw and electrifying music that reignited the imagination of young Australians, lead singer Peter Garrett committed to run for a Senate seat for the Nuclear Disarmament Party. With the mounting pressure of balancing the demands of music and politics this was the year that would make, but nearly break, Australia’s most important rock and roll band. 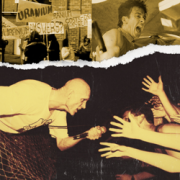 Thirty years in the making and featuring never seen before seen footage of the band on and off the stage, MIDNIGHT OIL 1984 is the untold story of the year Australia’s most iconic rock band inspired the nation to believe in the power of music to change the world. 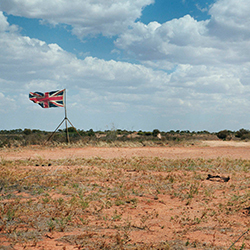 Robin Gerster, (Professor at the School of Languages, Literatures, Cultures and Linguistics at Monash University) and two authors examine and explore their process of bringing the story of Maralinga and the effects of the British testing program to print, each from a different perspective. Farewell of the exhibition with artists and community members. 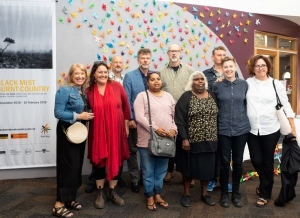 Special screening of the projection works Ngurini / 10 Minutes to Midnight with an introduction by Paul Brown, Hon A/Prof & Creative Producer Nuclear Futures, University of NSW.